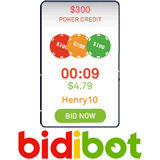 Bidibot.com, online gambling’s penny auction site, has already awarded over a quarter of a million dollars in free poker chips and other prizes to its customers. Offering everything from account credit at some of the biggest online poker and casino sites in the world to iPads and Video Games Consoles, Bidibot.com has very quickly become a major force in the industry. To celebrate Bidibot.com’s unprecedented success and $250,000 prize milestone, the site has announced that it will be auctioning off $2,500 in cash, offering yet more amazing value to its customers. Bidders continue to grab bargains on average 90% below its suggested retail price. In September, pro poker player Mark Herron won a GUKPT package valued at over £1,000 for only $3.18, while another happy customer walked away with an iPad for the discount price of $5.10. More recently Bidibot user, TheHulk, followed-up on a $5.38 iPad win by picking up an Xbox 360 for only $2.01 (representing a 99.26% discount).